Ten years after the financial crisis caused millions of Americans to lose their jobs, houses or both, the head of the nation's largest bank said he knows many people remain angry at banks. (NEW YORK) — Ten years after the financial crisis caused millions of Americans to lose their jobs, houses or both, the head of the nation’s largest bank said he knows many people remain angry at banks. JPMorgan Chase CEO Jamie Dimon told ABC News’ Rebecca Jarvis that some in the public see it as unfair that banks, which helped to spark the crash through high-risk lending, got a federal bailout while many ordinary people suffered. Dimon said some banks caused the problem. “And I understand that the American public looks at it and it’s unfair, and it was,” Dimon said in an exclusive interview for This Week. He said the public sees it as “the elite Washington banks” being bailed out, while they suffered. “And there’s some truth to that. They didn’t see ‘Old Testament’ justice. So I understand why there is a lot of anger out there,” he added. The crisis — the worst financial downturn since the Great Depression — was triggered by the bursting of a bubble in housing prices that had been fueled in part by increased risk in mortgage lending. Housing foreclosures soared, and unemployment reached 10 percent. But despite allegations of irresponsible lending and wrongdoing by some big banks, the U.S. government helped bail out some of the largest financial institutions, and no bank executives were prosecuted. Now, with unemployment below 4 percent and high consumer confidence, Jarvis asked Dimon how much credit President Trump deserves for the strength of the economy. Dimon added that the banking system is strong, and the collapse of a major institution like that of investment bank Lehman Brothers in 2008 could not happen today. “The banking system is very, very, very healthy. And regulators should actually take a little bit of a victory lap because Lehman would not happen today,” he said. 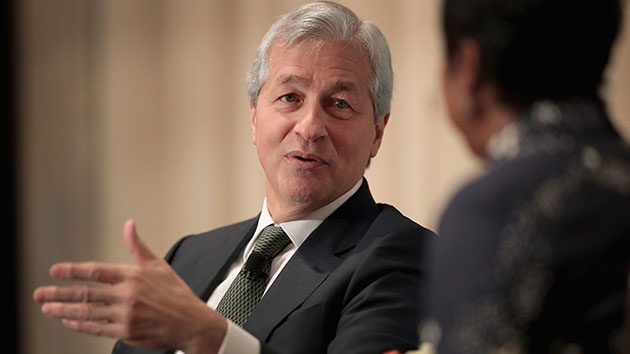 Dimon spoke to Jarvis after a public panel at JPMorgan Chase on Wednesday where he took aim at Trump, suggesting he could beat the president in an election. Afterward, in his one-on-one interview with Jarvis, Dimon walked back his remarks. Dimon’s remarks at the panel prompted a response from Trump, who slammed the banker as lacking the “aptitude” or “smarts” to run for president.